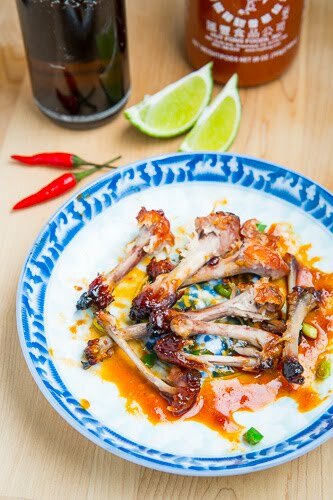 Chicken wings in a salty, sweet, sour, spicy Vietnamese caramel sauce inspired by Pok Pok chicken wings. Last year when I visited Portland I got the chance to stop by Pok Pok to try their chicken wings, which were very good, and I remember thinking that I would have to try making them at home. When I made the buffalo wings the other day I recalled this thought and I could not resist making them for snacking on while watching the game. 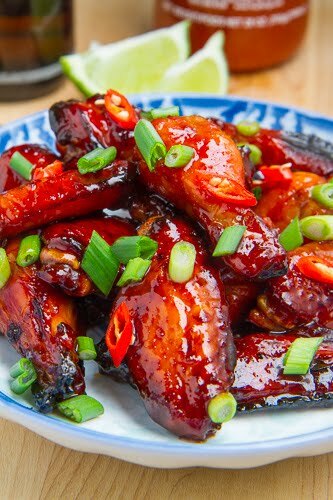 As it turns out there are several versions of the recipe online and they reminded me of a Vietnamese style savoury caramel sauce which I use fairly frequently and spicy caramel chicken wings sounded fantastic! The Vietnamese style savoury caramel sauce weaves a perfect blend of salty, sweet, sour, spicy by making a caramel and instead of adding cream or water it uses salty fish sauce, sour lime juice and spicy chilies or chili sauce along with some garlic for flavour. For the recipe, I decided to go with this simple savoury caramel sauce which I marinated the chicken wings in and then reduced it to thicken to toss the wings in and glaze them after baking. When I think chicken wings, I think spicy so I loaded up on the sriracha and the wings turned out super tasty and perfectly hot and spicy! The only real problem that I had was that the thick caramel sauce was a little sticky and messy but hey, they wouldn’t be chicken wings without a little mess! 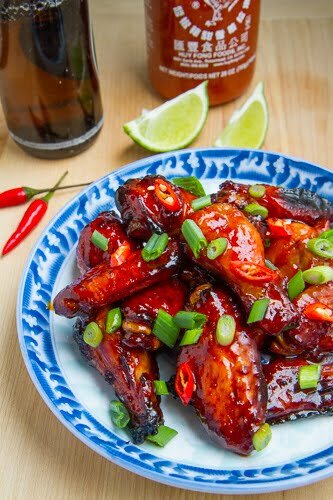 These Vietnamese style spicy caramel chicken wings will make an excellent addition to my lineup of snacks for the big game! Get them while their hot because they will disappear fast! Mix the fish sauce, lime juice, chili sauce, and garlic and carefully add it to the pan, then heat until the caramel dissolves. Place the chicken wings on a rack, on a foil lined baking sheet and bake in a preheated 400F/200C oven until golden brown and crispy, about 25-30 minutes. Yum, I love the combination of it ! Those wings look absolutely delicious! and hey, chicken wings are meant for eating with your fingers so who cares if your hands get a bit messy! BEFORE YOU USE RESERVE MARINADE…..
Love the gorgeous color. Perfect for licking off of sticky fingers. LOVE this – looks so scrummy! Anonymous: You can definitely make extra caramel sauce and reserve some for the glaze rather than using the marinade. Wow! These look amazing and I've got to go home after work and make these! Yum! I love that I already pinned this this weekend and thought how INCREDIBLE these looked!! I am worse off every morning I come to your blog because I leave so hungry, BUT I'm better a few seconds later after I pass the hunger – because I LOVE your recipes! I bet they smell like heaven!! Sticky, gooey and fabulous lookin chicken recipe Kevin! Kevin, these look so vibrant and delicious!! Can't wait to try the sauce. I am not a wing person but I think this would work well over boneless breasts. And Vietnamese is my absolute favorite! wow….love the look of the wings….looks delicious. I am giving away a lovely CookBook this month . For a chance to win. Enter here. I agree that all sources always say to NEVER reuse a marinade that handled raw meat/poultry. Although this is heated in this recipe, it is still a cooking no-no. I say, reserve some. My boyfriend is having a problem making the caramel part of the sauce, it started getting dry or something and started re crystalizing. Not sure what to tell him. Katie: When you add the cool liquid mixture to the hot caramel it may seize up a bit but it will melt back into a liquid if you heat it over medium heat for a few more minutes. I just made this… my caramel never turned colors. It went from white/clear syrup, to suddenly started crystalizing (still white). I went ahead and added the other items at that point, but after that it just stayed 'water like' in consistency… never got sticky again. i didn't think i did, but maybe i simmered it a little too fast? any other tips on making the caramel? wendy: It sounds like you did not simmer the water and sugar long enough. It will definitely start to turn a golden brown when cooked long enough at medium heat, though keep you eye on t a once it starts to turn it will turn quickly. Sorry to be so dumb, but what is fish sauce? Is it malt vinegar? Thanks! Anna McWhite: Fis sauce is an Asian sauce made by fermenting fish. It does not taste all that much like fish, more salty. You can replace it with a light soy sauce if you cannot find it. I've made this sooo many times, thanks for this recipe! They're amaaazing. I loved the flavor of this recipe! However, mine didn't come out with that gorgeous red caramel color yours have. Did I do something wrong? Anonymous: I am glad that you enjoyed them! When you made the caramel did you get a nice deep amber colour before adding the other ingredients? After getting a nice amber colour in the caramel, the chili sauce is responsible for the rest of the red colour and the more you use the redder it gets. Delicious looking chicken wings. I have to try something like that. I didn't have any limes so I substituted hot Indian lime relish for the limes and sriracha. Very tasty. thumbivaa: I'm glad that you enjoyed them and thanks for sharing the photo! Did you strain the garlic out? Mine still has chilli and garlic bits. Yours appears clear. Just made these and their disappointingly aweful. I followed the instructions and they taste so salty. The fish sauce is overwhelming. Not to mention my house smells pretty bad too (didnt burn anything just smells like salty a $$). Ive made other vietnamese dishes that use fish sauce and not had any issues. Maybe substitute fish sauce with soy sauce. Anonymous: There should be a nice balance of sweet, salty, sour and spicy in this sauce. I have found that some people really don't like fish sauce all that much and they would prefer to use say a teaspoon where a recipe would normally call for a tablespoon and for those I highly recommend replacing some or all of the fish sauce with soy sauce. Anonymous: No I do not strain the garlic out and it is interesting that none of it appeared in the photos! Clearly, you don't know HOW TO EAT WINGS.